To be honest, I am not very sure why I am reviewing this. I was on holiday, I only had my Wii, had finished Resident Evil 4, and I needed a game to play. I wasn’t expecting much and I was STILL disappointing. Well, this is one of those On-Rail Shooters that were popular in the 80’s/90s, and died a death when CRT TVs stopped being the norm. The Wii, bless it, tried to reinvigorated the market for shooting games, but from what I saw of them, they weren’t very good. The only difference between this and a traditional arcade shooter is the addition of the Wii Nunchuck, which allowed you to look around shoot at things off screen, or choose alternative paths. And, that is pretty much it. You point a Wiimote at the screen and make shooty noises. Have you played Resident Evil Zero, or REBirth? What you get here is the same thing, just from a 1st person perspective. It is pretty cool to see key location in this view, and does add something. It doesn’t stick to the story, so some poetic license with the source material has been taken. Umbrella Chronicles splits each game into 3 sections per scenario, so… You play 3 levels of Zero (Train/Training Facility/end bit), Resident Evil 1 (House/Living quarters/Lab), and Nemesis. 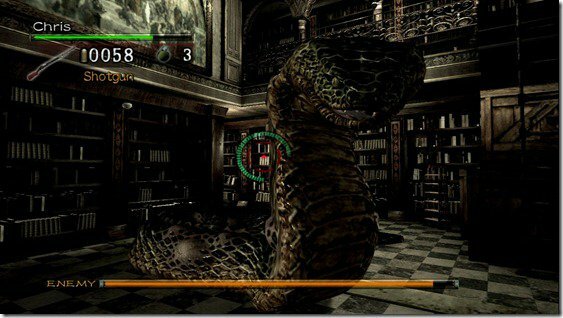 The Nemesis sections put you are in the Raccoon City, through generic sewers/car parks, and finally the Police station, so the first third of the game. The Nemesis sections are REALLY disappointing. There is one final section, which is an Umbrella base in Russia. This quickly introduces, a new setting, and a new boss, you kill them and they are never heard of again. It is pretty poor to be honest even by Capcom standards. It would have been better if the whole game was dedicated to what happened to Umbrella, rather than one quick scenario, which had more plotholes than closure. As well as the main missions, there are some attempts to tie up loose ends with some mini-missions. 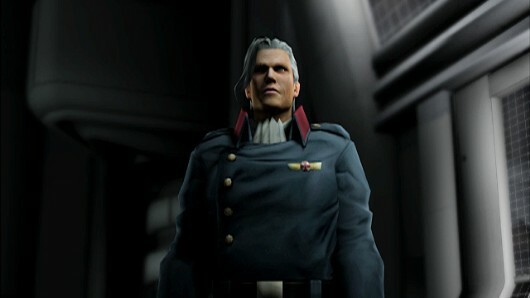 For example, there is a mission showing how Rebecca got to the Spencer Mansion, how Wesker got out of Zero. These missions also quickly introduce the head of Umbrella through Wesker where you VERY quickly kill him. Making Sergei’s appearance pretty pointless. It honestly feels all a little pointless and tacked on. If this was 3-4 hours of a game all about Umbrella it would have been better. Instead they tack this on at the end, and called it the Umberlla Chronicles. You are limited to 5 weapon types in the game, and as you progress you unlock more and more of the same type. You can also upgrade your weapons, but this is fairly redundant. It is VERY expensive to upgrade, and the upgrades are pretty useless. My advice is, don’t upgrade. Unlock all weapons first, then upgrade the top weapons. DO NOT WASTE UPGRADE POINTS ON FIRST TWO TIERS OF WEAPON. The gameplay is also a little backward for me. Shooting the Zombies, dogs, and hunters are fun. The bosses are just tedious grinds that take too long. 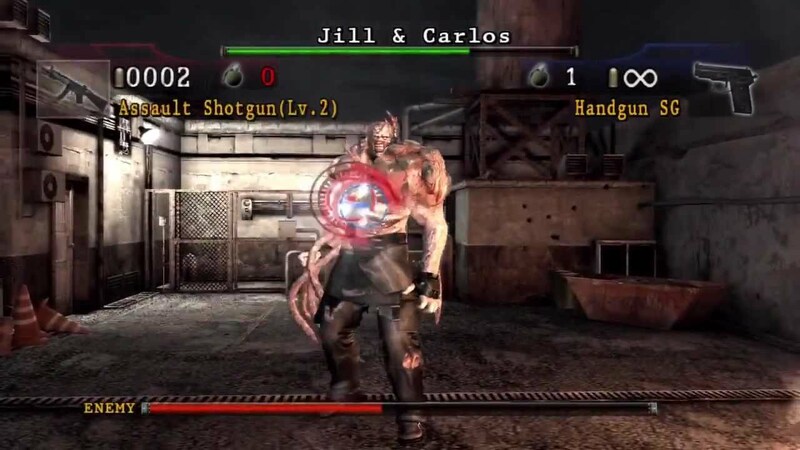 I know they had to change things for an on-rails shooter, but having most bosses a bullett sponge is just boring. Now this might be an issue with my Wiimote, or my configuration, but the aim is pretty pants. To get a critical headshot, you have to be pixel perfect on the forehead, and this radius seems to shrink as you progress. So a headshot in the first scenario, wouldn’t be a headshot in 3rd. There might be more to it, like there is in the Darkside Chronicles, but I still can’t get my head around headshots here. Small creatures like Leeches and Bats are a pain too, as they are next to impossible to hit. The leeches are particularly annoying, as they take 1 shot to kill. But when they jump on you, they take two hits to die. 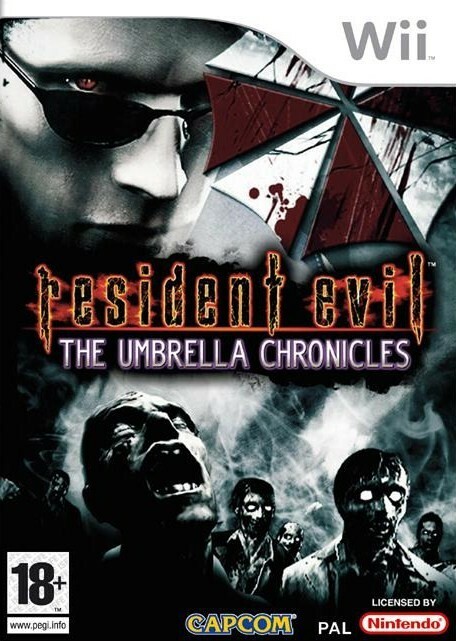 Umbrella Chronicles is a fun shooter for about 10 minutes, and if they focused on the Umbrella side of the story arcs it would have been a good addition to the franchise. However, having the two alright scenarios, a poor Nemesis, and a tacked on 4th section, it ruins the game. As a result, this makes it half a game, and not an especially good half a game. They honestly stopped trying with this boss. I wasn’t aware that Umbrella Chronicles compares so unfavourably to Darkside Chronicles. In fact I was always of the impression they were nearly identical games, except for their scenarios. I found Darkside Chronicles solid, though it’s somewhat in a strange position between old school arcade style rail shooters and the innovative action adventure approach of Dead Space Extraction. Good to know there’s no reason to expand my collection by Umbrella Chronicles. I think if I went back and did Umbrella Chronicles again I’d give it a slightly better score (low 60s if I am feeling generous). But the problems with UC is that the Rebirth and Zero bits are great fun. The Res 3 and Russia bits are really lazy. The guns made no difference, bosses went on too long, upgrades were pants. DC built a game and made a story that connected things, it explained why you were going to places. UC just said, you’re in Res 1 now. DC adds something to the universe, and tries to explain who Krauser is.